The Cost of Capital is defined as the rate of return that a company must offer on its securities in order to maintain its market value. Financial managers must know the cost of capital in order to (a). make capital budgeting decisions, (b). help establish the optimal capital structure and (c). make decisions concerning leasing, bond refunding and working capital management. 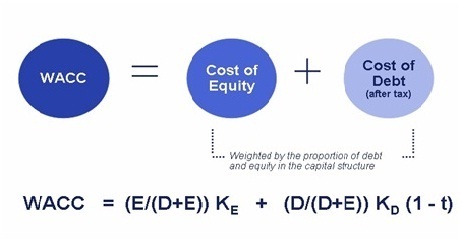 The cost of capital is computed as a weighted average of the various capital components, items on the right hand side of the balance sheet such as debt, preferred stock, common stock and retained earnings. Suppose this firm faces a corporate tax rate of 40%, has variable expenses equal to 30% of sales, and has fixed costs of $158. Working back from these requirements we can forecast the level of sales the firm must earn in order to achieve these operating results…thereby setting a sales performance target for management. This working backwards process is the approach taken by regulators to set pricing for rate of return regulated industries, like utilities. So cost of capital drives utility rate increases! Debt D of 8% annual coupon bonds with 10 years to maturity and book value of $1 m.
Preferred shares P with 10% annual dividend and book value of $1 m.
100,000 Common shares originally issued at $15/share for a value of $1.5 m.
The present market rate of similar risk 10 year bonds is 6% so the market value of the bonds is given by 80,000PVIFA(10 years, 6%) = [80000/.06](1-1/1.06^10) + 1,000,000/1.06^10 = $1,147,202. Similar risk preferred shares are providing yields of 8%, so the market value of the preferred shares is 100,000/.08 = $1,250,000. The market value of the common shares is currently $25/share, so the total market value of the shares is $2,500,000. The market value of the firm’s balance sheet V = D + P + SE = $1,147,202 + $1,250,000 + $2,500,000 = $4,897,202 and D/V = .234, P/V = .255 and SE/V = .511. Very good post on the subject...! Thanks RAvi for your comment. Do read our lates post on Capital Structure - I am sure you will like it.